Plant stem cells can create all differentiated cell types and have the ability to self renew, they also never undergo an actual ageing process but give rise to new specialized and unspecialized cells that can play any type of function and are capable of repairing any type of tissue. 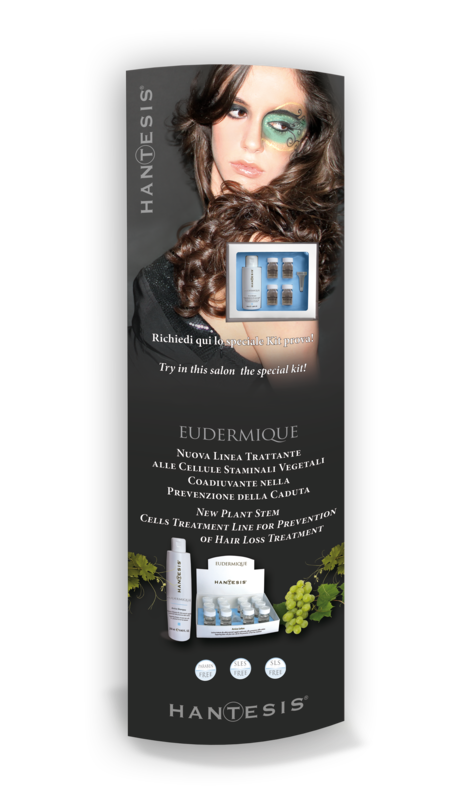 These cells have epigenetic factors similar to human cells that are able to nourish, tone and revitalize the scalp and the cellular structure of the hair. The properties that create restructuring of the plant stem cells are also able to extend the life of the hair follicle and thus slow down the process of hair loss. Through specific processes of cultures in the laboratory, we were able to obtain plant stem cells from a selection of unripe grape berries. These have an extremely high vitality and therefore a greater potential for growth. The plant stem cells, derived from unripe berries of grapes favour an important antioxidant action and are a great help to counteract the damaging free radical species caused by endogenous factors (stress, smoking, poor diet, …) and exogenous (pollution, radiation UV, …). 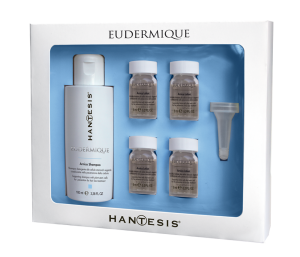 Their effectiveness is maintained within cosmetic formulations giving a proven anti-aging. Adjuvant Shampoo for hair loss containing plant stem cells, without salt, SLES and SLS. The presence of Arginine, which has strengthening and restructuring properties, helps to rebuild damaged and brittle hair. Furthermore, the presence of natural extracts of ginger, nutmeg and cloves helps play as a tonic and stimulant, increasing the peripheral microcirculation in the scalp, which improves oxygenation of the hair. It also contains essential oils of Peppermint and Eucalyptus, which is very refreshing and stimulating. It will also give an energy boost to the brittle hair. The presence of the essential oil Cajuput with its purifying properties also helps keep the skin clean and favors the natural oxygenation of the scalp. DIRECTIONS: Apply to wet hair. Massage and rinse thoroughly. Repeat application if necessary. 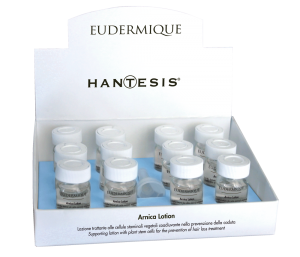 Adjuvant Lotion for hair loss containing plant stem cells. Contains natural extracts of Arnica, Capsicum, Nettle and Ginseng, which promote peripheral microcirculation and improve the oxygenation of the hair bulb. These natural extracts in synergy with a complex of amino acids and vitamin B12 help to increase the resistance of the hair, energizing the scalp and help correct oxygenation of the same. DIRECTIONS: apply directly to the skin and massage until completely absorbed. 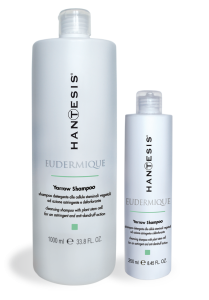 Astringent and anti-dandruff shampoo with plant stem cells without salt, SLES and SLS. It also contains Piroctone Olamine an active cleansing agent that ensures complete cleansing of the scalp as well as the elimination of excess dandruff. 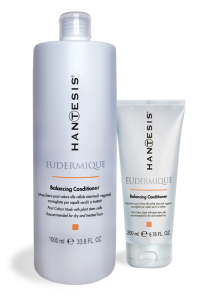 The presence of Zinc Pyrithione helps to eliminate dandruff and restore the natural balance of the scalp. DIRECTIONS: shake well before use. Apply to wet hair. Massage and rinse thoroughly. Repeat as necessary. Post Color Shampoo with plant cells recommended for dry and treated hair and Paraben free. It contains Orange extract with antioxidant properties and Macadamia oil, which moisturizes and polishes the hair with the perfect balance of hydration. Post Color Mask with plant cells recommended for dry and treated hair and Salt and Paraben free. It contains Orange extract with antioxidant properties and macadamia oil to moisturize and polish the hair. 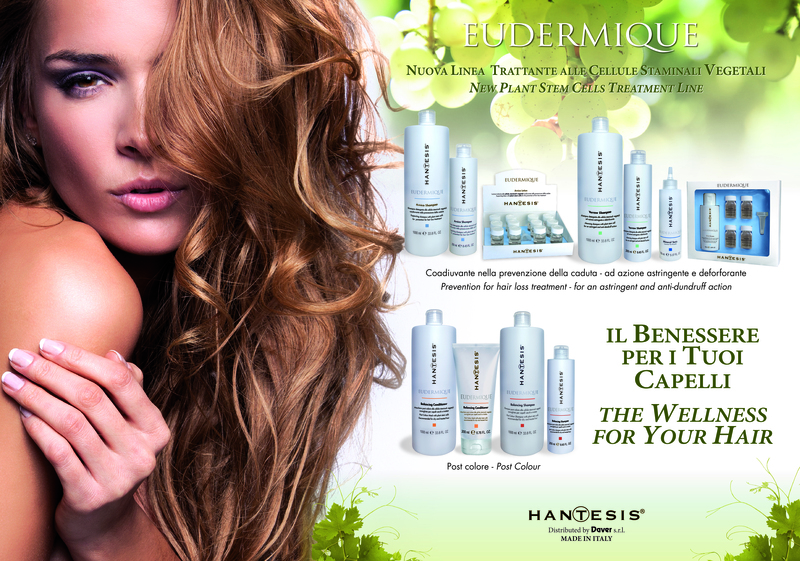 It guarantees the necessary hydration to colored hair and the pH acid balance ensures closure of the hair scales. Regular use of this lotion keeps the scalp constantly moisturized, clean and refreshed thus preventing skin disorders such as itching, bad odors, etc. It also favors cell oxygenation and regeneration. DIRECTIONS: apply the necessary amount of product after shampoo or apply directly to the scalp when the hair is dry. Do not rinse.